If you are aware with Index well or if you have read all my previous articles related to Index, you might aware that Index can increase the speed of SELECT statement but can reduce INSERT/UPDATE/DELETE performance so it is better to remove Unused index, it will not only give benefit to INSERT/ UPDATE/ DELETE but it will free up some disk space resources too. So, after this clarification you understand the requirement of deleting unused Index, right? But how to find which index has never been used? Well I have written one small snippet of TSQL for the same which I am going to share with you. Note: statistics you are going to see with below given script, would be refreshed and start collecting data again from zero if you restart you server instance or database. So, first decide your business cycle, let SQL Server collect data and then run the following script to know exact situation otherwise it may happen that some query runs regularly so you can see its stats and few run only once or twice in a month or a quarter and you don’t see its stats and based on that you drop the index which affect the query when it start running at its regular time after a month or quarter. Be sure before droping any index, give it a second thought before deleting it. This is usually a good practice if you are doing this on production server. if you want to refer all other articles related to index, click here. 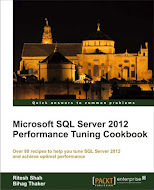 This entry was posted in Uncategorized and tagged index, Microsoft, MS SQL Server, Ritesh Shah on June 27, 2011 by Riteshshah. Thanks for your comment, it is corrected now. This is very handy command to find the indexes which are not in use. One should aware that this may also include indexes which may be used in future as this give result from last update statistics only.